Who’s coming up on Monday March 6? 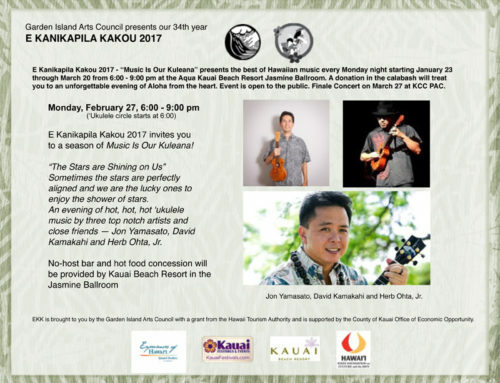 “I could kick myself for missing EKK this week!” I got feedback like this as the word got out what a fabulous EKK night was presented by three outstanding young musicians – Herb Ohta Jr., David Kamakahi and Jon Yamasato. But don’t let their youth belie their accomplishments. These three have been long time friends musically and personally and enjoy musical geneology that is rare and impressive for most musicians. Because they had not played together for awhile, it was an evening of jamming where they just asked, “What key is it in?” and from the get-go, it was a show of few words and just a lot of fabulous music. John Cruz’s We Do It Island Style had their fingers flying like jumping fleas, the namesake of the humble ‘ukulele. I recall that Herb once told us that his Dad, the famous ukulele legend Ohta-san, had him practice by lying on the floor so he could not look at his fingers and could feel and hear what he was doing. 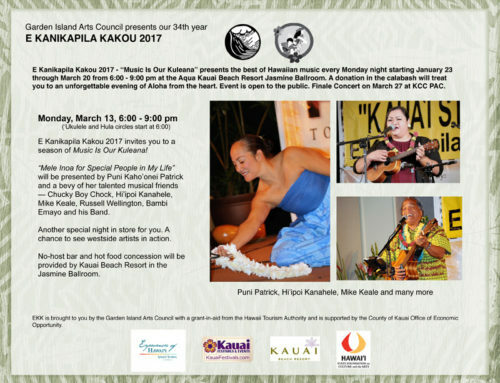 All that early training paid off as today he is one of the most accomplished ‘ukulele players and ‘ukulele instructors in Hawai’i and multiple Na Hoku Hanohano awardee. Not surprisingly, many of the songs they performed reflected their connection with their musical mentors. Leading off with a song that speaks of the geneology of the chiefs of Maui by Dennis Kamakahi set the pace and quality of the music for the evening. Earlier in the ‘ukulele circle, Herb and David had taught a Kamakahi song titled Kahokulani about a young man going on a boat trip and leaving his beautiful girlfriend behind, saying farewell and promising to come back home to her. Herb had taught the ‘ukulele players a picking style as an alternative to just strumming; the group liked this. Upon request, David shared one of Dennis’s songs, Na Makani Eha, about the winds that blew through each of the four valleys in Molokai. His dad shared the hidden meaning or kauna behind the winds … about the pirate in his family and about the four different women in each valley. Jon, the lead vocalist, having spent a few days in Molokai, sang the familiar Dennis Kamakahi hula mele, Wahine ‘Ilikea, about the mysterious mountain in Molokai that inspired this song. David talked about the musicians of the Hawaiian renaissance that he misses; among them is his mentor Eddie Kamae who influenced him a lot to play music. David would watch the Sons of Hawai’itapes over and over just to see how he played the ‘ukulele. As a tribute, he sang one of Eddie’s best known and best loved songs E Ku’u Morning Dew. You could see the sensitivity with which the other two joined in with backup because David was picking out a very delicate arrangement for the melody of this song. When David called on Herb to do a pa’ani, it was a seriously delicate pa’ani played in Herb’s signature style. He is a master at the sensitive sounds that the ‘ukulele can make. Another Molokai song by Dennis which is not as well known but definitely a winner is E Pupu Kani’oe about the singing snails in the trees that sound like children crying. These singing snails are found in Halawa valley where they once lived. Nostalgia seemed to be one of the sentiments of the night. Early in their musical careers, Herb and Jon had recorded two CD’s, Take Oneand Take Two. In the first CD they had taken a song made famous by Melveen Leed and given it their own twist on the song. Paniolo Country on ‘ukulele was a lively version and much appreciated by the audience. Changing the pace a bit, Jon sang Green Rose Hula, a hula favorite by the late Johnny Almeida which Jon recorded 20 years ago. It was a fun song with a great deal of finger action. You could see the difference in the style of playing by each musician, but the way they all blended together was pretty amazing. On the Take One CD, Jon and Herb included Jerry Santos’s E Ku’u Home O Kahalu’u. Jon took the lead vocals on this and the accompaniment was terrific; you could really see how these three enjoy playing music together. In the 1990’s one of the first recording projects on Take One CD by Herb and Jon ended up with a song that Herb had co-wrote in ten minutes. It was calledG Minor. “If you like it…clap! If you don’t like it, PLEASE clap!” requested Herb. Resounding applause. It was so lively and their playing was awesome …. another jumping flea surprise. Herb recalls an Arizona road trip with his manager where all he heard was music of the 70’s and 80’s, probably because his manager was older. It had something to do with the music of Christopher Cross, whose concert Jon confessed was highly disappointing to him. When Herb returned to Hawai’i, he went to play at the Leahi elderly care home on O’ahu. One of the patients asked him, “Can you play something new?” at which point he played his newly composed, yet unnamed Arizona song, and dedicated the song to the elders there. He named it Leahi Morning because the seniors liked it so much. Before the intermission, Herb played his version of Somewhere Over the Rainbow to show how great the donated Kamoa ‘ukulele sounds; it brought him major applause. For Jon, this trip to Kauai, the first time in ten years, was a chance to unwind from his usual hectic city pace. He said he sits at his desk and dreams of Kaua’i. To commemorate this long-awaited trip, he sang the light-hearted Hele on to Kauai. He nodded to Herb to take the pa’ani; what an incredible and effortless picking style he has. Jon wanted to share a song that he wrote for his wife titled Emily. After he sang the wonderful lyrics about everything she is to him, he turned to Herb and asked him, “What is my wife’s name?” Herb looked at him with his dead-pan expression and replied, “Stacy.” Again, Herb gave him the look which actually says a lot more than words. “Does your wife know about this?” Jon explained that he can never play music in the house because it’s loud and disturbs everyone watching TV, so he has to sit in his car outside to be able to have his alone time to compose songs, “so this is what happens when I go and write a song in my car.” The name Emily seemed at the time more appropriate in the song …. even if he was writing it for his wife Stacy. When Elvis Presley was in Hawai’i playing at a concert for the Pearl Harbor Memorial, one of the songs in the movie Blue Hawaii that made an impression on the guys was the romantic ballad Can’t Help Falling in Love with You. Their version definitely afforded the ‘ukulele players a great chance to show off what the little instrument can do. It sounded very different from the romantic crooning of Elvis. For a definite change of pace, the three played Sir Duke, a Stevie Wonder song that really put the trio in the groove and had the audience loving it. Along the same lines they threw in another song, the title of which I did not catch … but they were all in the same key. Wonderful! 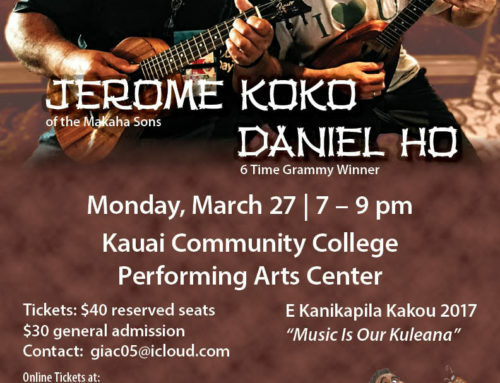 Of course if you are on Kaua’i and you are featuring the songs of Dennis Kamakahi, Koke’e is definitely a must. 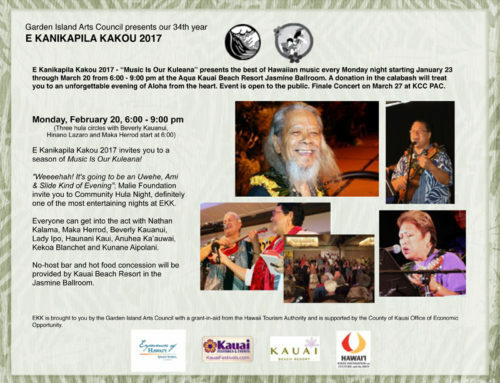 The warmth of the song, the positive memories of the many EKK concerts that Dennis shared on Kaua’i fueled the singing as audience members joined in; it’s a song that nearly everyone knows. By the time everyone joined in on Hawai’i Aloha, the mood of the audience was one of great inspiration and appreciation for the new generation of Hawaii’s talents. They are making their own history in the music world, sparked by the years of caring mentorship and fueled by their own dedication to the craft and god-given talent, these young musicians are the ones that will be leading and sharing and nurturing the next generation of musicians. 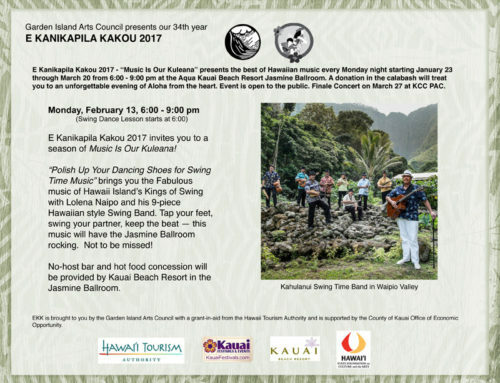 E Kanikapila Kakou 2017 Hawaiian Music Program is funded in part by the Hawai’i Tourism Authority, the County of Kaua’i Office of Economic Development, and the Garden Island Arts Council supporters with support from the Kaua’i Beach Resort.